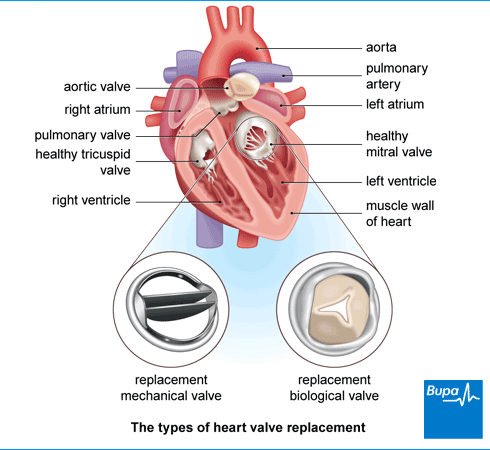 Heart valve surgery is an operation to treat leaking or narrowed valves (heart valve disease). It involves repairing or replacing one or more of your heart valves with the aim of improving your symptoms or even curing them. It may also prolong your life by preventing permanent damage to your heart or by preventing some of the complications of heart valve disease. Heart valve replacement surgery involves repairing or replacing one or more heart valves that may be diseased or damaged. Heart valve surgery is usually done in a specialist centre which may not be your local hospital. There will be a team of doctors, nurses and other healthcare staff who are experts in looking after patients needing heart surgery. They will carefully explain what will happen, and answer any questions you have. Your surgeon may recommend that you have your faulty valve replaced with a new prosthetic (artificial) one. There are two main types of prosthetic valves. Mechanical valves. These are made from carbon and metal and are very long lasting. If you have this type of valve you’ll need to take blood thinning medicine (anticoagulants) for the rest of your life. This is to prevent blood clots forming. Tissue (biological or bioprosthetic) valves. These are usually made from animal (pig or cow) tissue and may wear out faster than mechanical valves. They may need to be replaced every 10 to 20 years. You may not need to take life-long blood thinning medicine with this type of valve. Your surgeon will discuss the pros and cons of each type of valve and help you decide which is best for you. Before you go into hospital, think about any preparations you need to make. Note that many people are in hospital for about a week after this type of surgery. You may need to arrange for family or friends to be with you for a while to help with things like cooking, shopping and cleaning. (Remember you won’t be able to drive or do heavy lifting for some time after your surgery – your surgeon will advise you about this). If you can, it’s a good idea to stock the freezer with some pre-prepared meals. Your surgeon will explain how to prepare for your operation. If you smoke, you will be strongly advised to stop. This is because smoking increases your risk of getting a chest or wound infection, which can mean it takes longer to recover after the operation. You’ll have your heart valve surgery under general anaesthesia. This means you’ll be asleep during the operation. A general anaesthetic can make you sick so it’s important that you don’t eat or drink anything for six hours before your operation. Follow your anaesthetist or surgeon’s advice – it’s important to have an empty stomach before having a general anaesthetic. If you have any questions, just ask. You may need to wear compression stockings to keep your blood flowing. You may also need to have an injection of a medicine called heparin to help prevent blood clots forming in the veins in your legs. Your surgeon will talk to you about will happen before, during and after your procedure. This is your opportunity to ask any questions you have so you can really understand what will happen. You may find it helpful to prepare questions in advance, for example about the risks, benefits and any alternatives to the procedure. Once you understand the procedure and if you agree to have it, you’ll be asked to sign a consent form. If you have mild heart valve disease, medicines may relieve your symptoms. But when the heart valve problem begins to affect the ability of your heart to pump blood, then repair or replacement may be necessary. You’ll have a general anaesthetic, which means you’ll be asleep during the procedure. Your surgeon may make a cut down the middle of your breastbone (sternum) to reach your heart. Your heart can’t work as it would usually while it’s being operated on so a bypass machine will be used to do this instead. This will make sure that blood continues to be pumped around your body. There are a number of different ways to mend a faulty heart valve. If your valve isn’t seriously damaged, it may be possible to repair it in different ways. For example, a narrowed valve can be widened or an artificial support may be added to strengthen the valve. If your valve is seriously damaged, it may have to be replaced. Your surgeon may replace it with a mechanical valve or a tissue (biological or bioprosthetic) valve. After your operation, your surgeon will rejoin your breastbone using wires. They’ll then close the skin on your chest with dissolvable stitches. In some circumstances other procedures may be possible. Keyhole (minimally invasive, minimal access) surgery is sometimes an option. This means you may not have to have a cut in your breastbone. Instead your surgeon will make several small cuts in your skin to open parts of your chest. Percutaneous valve replacement, such as transcatheter aortic valve implantation (TAVI). This involves your surgeon passing a tube through a blood vessel in your groin or neck to replace or repair the heart valve. Your surgeon may offer you this procedure if you’re not well enough to have surgery. Inserting a mitral clip. This is a device that’s clipped onto one of your heart valves (the mitral valve) if it’s failing, to improve the way it works. The procedure can be done without having to have a cut in your breastbone. These types of surgery aren’t suitable for everybody. Talk with your surgeon about the best procedure for you. After the operation, you may be taken to the intensive care unit (ICU) or high dependency unit (HDU) of the hospital. When you wake up, you’ll be connected to machines that record the activity of your heart, lungs and other body systems. These might include a ventilator machine to help you breathe. When your medical team are happy you’re recovering safely they’ll move you to a surgical ward. You’ll need pain relief as the anaesthetic wears off. You may be given patient controlled analgesia (PCA) once you wake up. This is a pump that’s connected to a drip in your arm and allows you to control how much pain medicine you have. You’ll be encouraged to get out of bed and move around as soon as possible. This will help to prevent chest infections and blood clots in your legs. A physiotherapist will visit you regularly after the operation to help you do exercises to aid your recovery. You’ll be able to go home when you and your surgeon feel that you’re ready. Many people are in hospital for around five days after heart valve surgery. Make sure someone can take you and stay with you for a day or so. Your nurse will give you advice about caring for your healing wounds before you go home. You may be given a date for a follow-up appointment. If you have wires in your breastbone from the operation, these will be permanent. The dissolvable stitches your surgeon used to close your skin wound will slowly dissolve over several weeks and don’t need to be removed. You may need to be patient – a full recovery from heart valve surgery can take two to three months. If you have a mechanical valve replacement, you’ll need to take a blood thinning medicine (an anticoagulant, usually warfarin). You’ll need to take this for the rest of your life to prevent blood clots forming around the new valve. If you have a tissue (biological) valve replacement, you may only need to take these medicines for a few months after your operation. However, you may need them for longer. You shouldn’t drive for at least a month after your surgery, and then only when you feel you can do so safely. If you’re in any doubt about driving, contact your motor insurer so that you’re aware of their recommendations, and always follow your surgeon’s advice. Your surgeon will give you advice about how soon you can return to work and resume your other activities. Remember, you’ve been through a major operation. Expect to have good days and less good days. Be kind to yourself and accept help where it’s offered. Don’t worry if progress seems slow – you will gradually get back to your normal activities and feel well again. If you are concerned about these or any other symptoms, contact your GP. Complications are when problems occur during or after the operation. As with every procedure, there are some risks associated with heart valve surgery. Every patient is different – ask your surgeon to explain how these risks might apply to you. The list of possible complications of heart valve surgery may seem quite long. But don’t forget your surgeon will have weighed up any risks against the benefits before recommending surgery to you. Will I need medicines after my heart valve surgery? Will I need medicines after my heart valve surgery? This depends on the type of surgery you had and your health before the operation. You may need to take blood thinning medicines (anticoagulants) after your surgery as well as continuing with any you already took for your condition. After surgery, you may need to take a blood-thinning (anticoagulant) medicine, such as warfarin. These medicines help stop blood clots from forming. How long you will need to take these for depends on the type of heart valve surgery that you had. If you had a tissue (biological) valve, you may only need to take anticoagulants for a few months. But if you had a mechanical valve, you’ll need to take anticoagulants for the rest of your life. This is because these valves are made from non-biological material and so clots are more likely to form around them. While you’re taking anticoagulants, you’ll need to have regular blood tests to ensure you’re on the correct dose. This is very important because if you have too much of these medicines, it can lead to severe bleeding. Talk to your surgeon for more information about what medicines you need to take after your operation. Should I make lifestyle changes after my surgery? Should I make lifestyle changes after my surgery? If your heart valve disease was caused by coronary heart disease, it’s sensible to take measures to stop this getting worse. You may need to be careful how much alcohol you drink if you’re on blood-thinning medicines. After your operation, it’s really important to be careful about how much alcohol you drink. The effects of alcohol can be greater if you’re taking certain medicines and it can affect how they work. For example, alcohol affects how much warfarin thins your blood. It may be possible to drink some alcohol if you’re on warfarin, but be cautious. It’s important for everyone who drinks alcohol to stick to the recommended daily limits. Always read the patient information leaflet that comes with your medicine carefully. If you have questions about your medicines and how they might be affected by alcohol, ask your pharmacist. Why has my surgeon told me to look after my teeth? Why has my surgeon told me to look after my teeth? If you have a heart valve repaired and it gets infected, the infection can spread to the lining of your heart. This is known as endocarditis and it’s a serious, potentially life-threatening condition. The most common way for bacteria to get into your blood is from your mouth when you have dental treatment. So it’s important to look after your teeth and gums and have regular checkups with your dentist to reduce any need for this. It used to be the case that, if you were at risk of endocarditis you were offered antibiotics before every dental procedure. Experts now think this is not always necessary. Make sure your dentist knows that you’ve had heart valve surgery. They can then discuss with you the pros and cons of having antibiotics before your dental work. How can I help my recovery? How can I help my recovery? It can take up to three months to fully recover from heart valve surgery. During this time, you’ll need to build up your activities gradually to get back to normal. Our page on the ‘Cardiac rehabilitation programme’ has lots of information about what’s covered and what to expect if you take part. What exercises can I do after heart valve surgery? What exercises can I do after heart valve surgery? Your physiotherapist or nurse will usually help you to start moving about a couple of days after your surgery. Once you get home, build your activity levels up slowly until you’re back to normal. It’s important to keep active when you get home after your surgery, as this will help you to recover. Try to do the same amount of exercise at home as you did with your physiotherapist at the hospital. After the first few days, you can start to increase how much you do. Gentle walking is a good way to do this. It’s very important to increase your levels of physical activity gradually. Don’t do any strenuous or vigorous activity immediately as this may put a strain on your heart. Don’t do any heavy lifting for around six weeks after surgery if your surgeon cut through your breastbone (sternum) during your operation. This will allow time for the bone to heal. It’s important to rest properly too. Try to set aside specific times to rest and make sure that you stick to them. Take short naps if necessary. If you develop any of these symptoms and they don’t go away within 20 minutes, contact your GP. You may find that a good way to get back into regular exercise is to take part in a cardiac rehabilitation programme, if one is offered. See our FAQ on cardiac rehabilitation above for more information. How soon after the operation can I fly? How soon after the operation can I fly? This will depend on what type of procedure you had and how well you’re recovering. It’s best not to make any plans until your surgeon advises you it’s safe to do so. After heart surgery, it’s usually safe for you to fly around 10 days later but always check with your surgeon before you book a flight. If you get any complications after your surgery, such as an infection or symptoms such as chest pain, you may need to wait longer. You may find it difficult to carry or lift your baggage after your surgery so make sure you have someone to help you. If you’ve had percutaneous valve surgery rather than open surgery, you may be able to fly a few days after the operation. However, this will depend on how well you’re recovering. Ask your surgeon about flying and follow their advice. It’s also a good idea to check with your airline for their recommendations and to make any special arrangements you may need.